On June 6, 2014 the article entitled “Alcohol consumption and hormonalalterations related to muscle hypertrophy: a review” was accepted by the scientific journal “Nutrition and Metabolism”. What a great day for our research team, our review that tried to elucidate the consequences of excessive alcohol consumption was finally on-line. Unfortunately we didn’t know, and could not imagine, that was the beginning of an ordeal of injustice. The article was discussed in February 2013 and from then onwards, authors started to contribute and to edit to a draft manuscript. The draft manuscript was completed on the 11th October 2013 and consequently submitted it to the “Nutrients” journal (See image 1) (Examine.com article is dated March 12, 2014). Unfortunately the journal, after a few months rejected the manuscript and we decided to use the reviewers comments to further edit and submit it elsewhere. The next journal to receive our manuscript was “Nutrition and Metabolism”. The general process when intending to submit a manuscript to a scientific journal is to familiarize yourself with the instructions, editorial group guidelines (BMC) and policies given to authors. This usually requires a number of changes, such as reformatting of references, etc. Only when complying with all the requirements set out by the journal, we finally submitted our revised manuscript on the 27th of March 2014. After the peer-review process (three reviewers and two month spent in corrections), the Nutrition and Metabolism, with an impact factor of 3.36, accepted our manuscript on the 24th of May 2014. A few days after the on line publication, we receive an email from the editorial office of the journal, informing us that a commercial web-site called “Examine.com” had sent allegations of plagiarism against us to the journal (See image 2). We would like to point out that this web-site does not sell any kind of nutritional supplements. However, the guide to nutritional supplements is not free and the Examine.com frequently advertises the guide, which was consequently considered by us (and not only us) as a commercial and not a scientific web-site/platform. During the drafting process of the manuscript a number of commercial websites were consulted to find any additional related information. After the revision of references provided by Examine.com we found inconsistencies in content and conclusion with respect to alcohol consumption and muscular hypertrophy. Hence why our manuscript reports a different discussion and a different conclusion, both being compatible with the scientific literature provided. 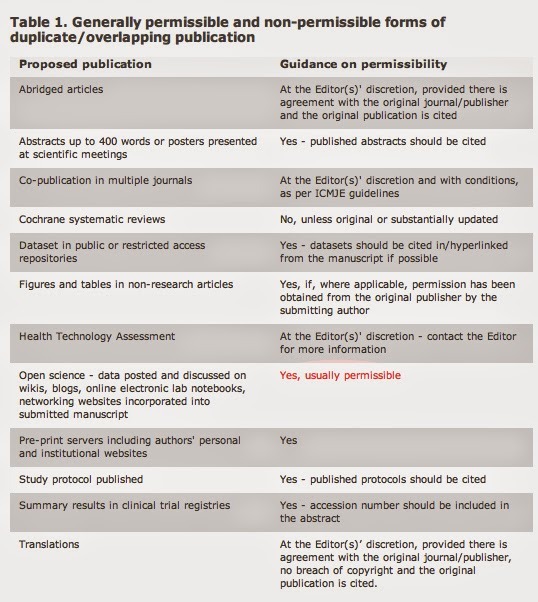 To emphasize our point, as researchers we always read the policies of each journal before submitting any work. Those found in the BMC group stated clearly that overlapping of open science sources (i.e. commercial websites) is usually permitted (See image 3). In addition having submitted to a journal with a high impact factor and having used the PRISMA statement (the statement consists of a 27-item checklist and a four-phase flow diagram) - (the checklist includes items deemed essential for transparent reporting of a systematic review), as a guideline in the writing of a manuscript. Therefore no gray sources of information (i.e. a non-peer reviewed, commercial web-iste) was cited in the manuscript (We reported all appropriate references, no more, no less). However, as some of the information provided by examine.com did not conflict with our findings and as they were relevant, we decided to include those into our manuscript. We would like to point out that the editorial policies of BMC allow overlapping of open science (http://www.biomedcentral.com/about/editorialpolicies#exceptionsTable). In addition, we also asked for the copyright permission of both figures presented in the manuscript, underlining our intellectual honesty (See image 5) . Of course we are not new to publications practices and know how to avoid this type of situation but apparently being in line with the guidelines of a publishing corporation is not enough any longer. This story continued for nearly 3 month; during this period several emails were exchanged between us and the editorial office. ‘Surprisingly’ the editors finally decided to retract the article. A commercial web-site has won against a scientific institution (Money vs Science). From now on any commercial activity, according to such decision, could publish whatever they think is right and bias scientific information for commercial purposes. What will happen now? We don’t know if the website will copy part of our original work and claim it as theirs. In addition to such event we would like to point out that any web-master could modify the date of creation of a web-site so who can now tell any longer who the original author is? Interestingly the authors have recently received an e-mail by Nutrition and Metabolism stating that the manuscript was viewed more than 11.000 times (See image 6). Clearly, researchers seem to be interested more in the content rather than plagiarism accusations, as a retraction notice was not yet published. We retain that this is a very delicate case. The nature of the controversy between an university and a commercial company appears to be seriously damaging the world of nutrition in science. We kindly invite the readers to carefully read the examine article and our Systematic Review and make your own opinion.